Perogies & Gyoza: My Name is Elizabeth! I specifically chose both of my kids' names because they lend themselves to nicknames. My daughter loves her nicknames, and generally introduces herself differently every time. My son, however, only likes his given name, and tolerates being called Spinky. He hates all the other nicknames we give him. This may prove a problem when he's a J-League soccer player and the fans want to make up songs using various nicknames, but until then we'll deal. Just like Elizabeth's grandad, parents, friends, teachers, and everyone else around her (except her little brother) deal in My Name is Elizabeth! (CAN, JP, USA). 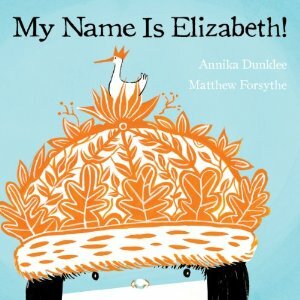 This delightful book was written by Annika Dunklee, illustrated by Matthew Forsythe, and published by Kids Can Press. It is one of two Canadian picture books appearing on the New York Times' Notable Children's Books list. Elizabeth is called by a variety of nicknames, it seems the only one silent on the matter is her pet duck. Then one day she decides she is going to stand up and make everyone aware of what she wants them to call her. She does this, however, without being precious or obnoxious, which is a pretty hard thing to do. She gains acceptance from everyone but her brother who just can't pronounce Elizabeth at his age, and she's okay with him trying. Like another Canadian classic, Red is Best, the lead character is a girl who knows her mind and is able to express that. This is really important to me, especially since Japanese culture doesn't always value this. I want both of my children to be able to speak their mind, and I'm glad these books show them other kids who do too. The entire book is written using speech bubbles, but there is no other text to distract, such as in manga or in the Magic Schoolbus series. The beauty of this is you get a first-person story, which really suits the character and her story. No one needs to speak for Elizabeth. It's also so nice to see that Elizabeth isn't a girly princess girl. Her room isn't pink, she has a skateboard, she is very relatable. It's the illustrations my kids love best- and so do I! The palette only consists of 4 colours- blue, orange, black, and white. This makes for illustrations that have that sort of retro but modern feel that hipsters love. So do I. I love it so much I painted my walls that blue (okay, that was last year). But that orange is so gorgeous with it, I am considering switching all the green out of my great room for orange. Just like in this book and the cover of Underground. This is the 18th book I read for the 5th Canadian Book Challenge.